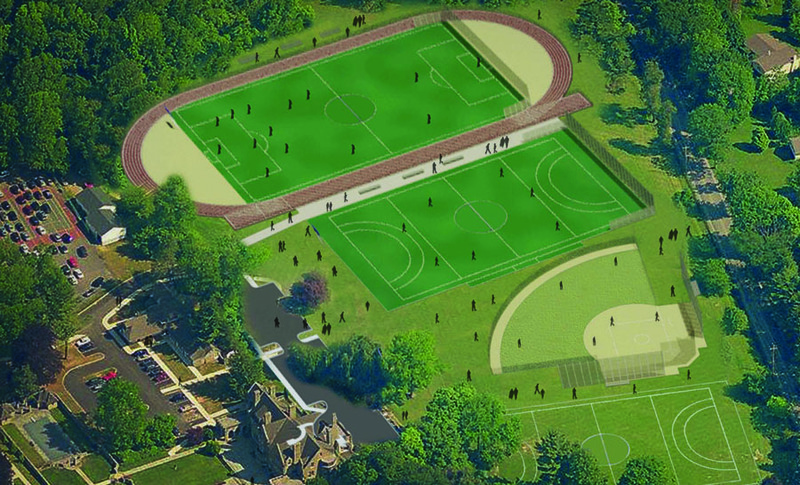 An artist's rendering of the Academy of Notre Dame campus depicts the new athletic fields under construction at the Villanova school for girls. Students representing the various outdoor sports at Academy of Notre Dame show their appreciation for the donors and planners of the new athletic field project of the campus. Work on new athletic fields at the Academy of Notre Dame in Villanova continues following a groundbreaking ceremony June 2 led by school president Judith A. Dwyer. The athletic fields initiative reflects several years of planning that involved representatives from the school’s administration, the Board of Trustees and consultants. Coaches and parents as well as members of the broader community worked to secure the necessary permits and approvals. On-site work began June 17 with the marking of utilities, relocation of sprinkler lines and the installation of safety fencing. An important first step in preparing for the field installation includes tree clearing in designated areas. A landscape architect made recommendations based on careful review by the Radnor Township arborist and the Shade Tree Commission. Over 400 new trees will be planted throughout the campus during the project, which offers the academy an opportunity to replace some of the aging mature trees that are reaching the later stages of their lives. In the design process, the school’s entrance road and parking area will be moved to save the weeping beech tree in front of the mansion. The next step is the installation of soil conservation measures as required by the Delaware County Soil Conservation District, followed by large scale earth moving operations. Part of these include the installation of underground retention areas that allow storm water runoff to be filtered and returned to an underground aquifer rather than run directly into local streams. In order to enhance emergency vehicle access to the entire campus, the township suggested that the academy add a new entrance from Godfrey Road that will connect to the main entrance road. The main entrance from Sproul Road and the current exit gate along Godfrey Road will remain. After construction, the existing Sproul Road exit will serve emergency vehicles only. Paving of the new roads will be completed over the summer to allow use of the existing main entrance by the time school opens in the fall. The academy anticipates that one of the turf fields will be ready for use at least for part of the fall sports season. Arrangements are being made for all the fall sports to practice and play off-site in the fall. Notre Dame Academy enrolls more than 500 young women in grades six through 12, located at 560 Sproul Road in Villanova.